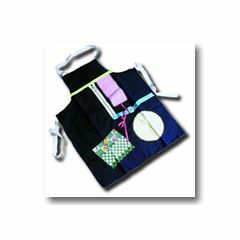 Discovery Apron is ideal to keep hands busy and divert negative behavior. Apron fits over the head and can be tied in back for security. Items include a large zipper, terry cloth flap, hook-and-loop fastener(s) brand-edged flap, button flap pocket, bow to tie and untie, buckle, and soft flannel area. Suitable for alzheimer's patients. Does this fit adults or children?